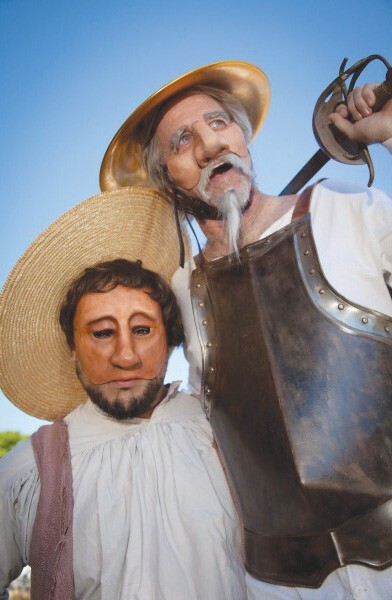 'Don Quixote' runs Friday–Sunday, Aug. 7–30, at Forest Meadows Amphitheater at Dominican University, 890 Belle Ave., San Rafael. $12–$35. 415.499.4488. '4000 Miles' runs Thursday–Sunday, Sept. 3–27, at Main Stage West, 104 N. Main St., Sebastopol. $15–$27. 707.823.0177. 'The Last Five Years' runs Thursday–Saturday, Aug. 13–15, at Raven Theater Windsor, 195 Windsor River Road, Windsor. $30. 707.433.6335. A n eldery woman and her free-spirited grandson; a heartbroken actress and her wandering husband; a delusional master and his faithful servant. These six characters do the heavy lifting in three shows opening over the next few weeks. Two of them, to the point, feature only two actors. In Amy Herzog's 4000 Miles, opening next month at Main Stage West, 91-year-old Vera is visited at 3am by her grandson, stopping by her East Village apartment after a disaster curtails his cross-country bicycle trip. Though initially antagonizing each other, the two eventually peel back layers of understanding and acceptance in this small play about the enormity of family. The two-person play gets an upgrade to musical status in Jason Robert Brown's ingenious Last Five Years, presented by the Raven Theater as a special three-day-only fundraiser. The gorgeously scored show tells the story of Jaime and Cathy, whose five-year relationship and marriage ends with a song. That's where the show begins, at the end, with Cathy (Nicole Thordsen) tracing the relationship from end to beginning, as Jamie (Zack Howard) tells the same story from beginning to end, with the pair meeting in the middle for one duet, at their wedding. Cervantes' epic comedy-adventure Don Quixote, though peopled with a massive cast, gets an excitingly intimate treatment when it opens this weekend at Marin Shakespeare Company's Forest Meadows Amphitheatre. In a bold adaptation by Peter Anderson and Colin Heath, the focus is on the eccentric Spanish nobleman Quixano (Ron Campbell), whose books of chivalry have convinced him he is the noble knight Quixote, and his devoted servant, Sancho Panza (John R. Lewis). Using a variety of masks and puppets, a supporting ensemble of five actors become the various antagonists and damsels in distress whom Quixote and Panza meet along the way, but the bond that holds the story together is the relationship between these two very different but inseparably devoted friends. All three shows prove that good theater is about the relationships between characters, whether a cast of dozens or just two interesting people.